For this month's "Maps of the Month" featurette, I wish to draw your attention to sprays's G.I. 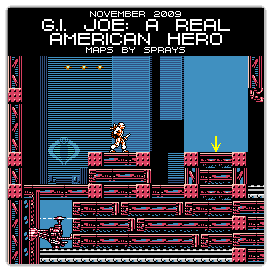 Joe: A Real American Hero (NES) maps. The G.I. Joe film may have been a big screen hit this summer, but the Joes have been around for decades. The 1980s incarnation of G.I. Joe is certainly one of the most "toyetic". There were hundreds of action figures and all sorts of crazy vehicles. And besides toys, there was also a Marvel comic, a cartoon series, and an animated movie...so it should come as no surprise that it had two NES games as well. Also back in the day, licensed games weren't quite as guaranteed to be bad. When handled by good developers, such as Capcom or Konami, a video game experience that includes characters from other media could still be a good video game experience. The first G.I. Joe NES game wasn't by either of them, but rather, Taxan. And it was still an involving platformer. It had multiple Joes to choose from, and they had different abilities. There was a variety of bosses, of course, recognizable as Cobra members or vehicles. The gameplay was also mixed; besides the usual horizontal and vertical platforming fare, there were also bases where bombs had to be placed at particular locations that changed depending on how many times you'd gone through the game. Since these maps are featured here, it's obvious that we're thanking sprays this month for providing us with this navigational intel. It's certainly good to know your way around these Cobra bases. And knowing is half the battle! So to recognize the effort put into helping us take down Cobra, sprays's G.I. Joe: A Real American Hero maps will be known as VGMaps.com's Maps of the Month for November 2009. Yo Joe!